The seeds of this trip were planted in October, when Chris Ayers answered the question "what region would you like to visit?" 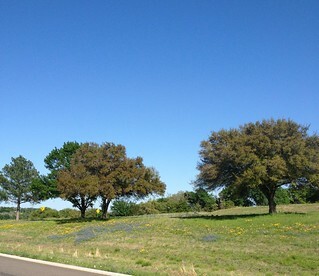 with "the Texas Hill Country". I said that I would love to go there with him and Amy, because I've spent lots of time visiting relatives in New Braunfels but little of it touristy. Over the next few months, that turned into a concrete plan to visit Austin for a long weekend in mid-April on Chris's spring break. - Even though Austin is more than two hundred miles from Dallas, it is within that psychological radius that says we should detour to Dallas to visit my parents. 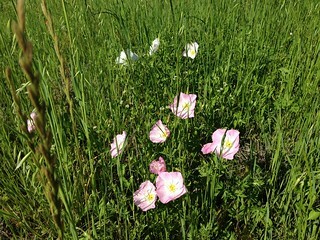 - Texas sows the margins of its interstates with wildflowers, so a long drive through Texas in early April can be really gorgeous. I have been halfheartedly keeping track of how many of our journeys have been messed up by airline problems, and I wasn't sure how to count this incident, because the flight delay did counterbalance our car delay a bit. But the question became moot. We didn't arrive at my parents' house until 1am. I'm sure that was hard on my parents; they tend to make their bedtime 10pm. I felt very touched that they stayed up to receive us, and I regretted that we'd missed a chance to socialize that evening. Thursday morning's breakfast was homemade pancakes with strawberries. I won't describe these in depth; the folks who are likely to eat pancakes at my parents' house already know what they're like. 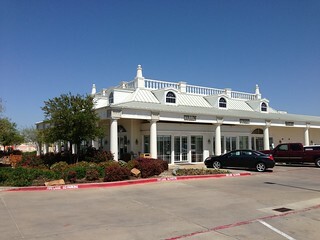 For lunch, my parents took us to Holy Frijoles, their Tex-Mex restaurant of choice. I had some rather good tacos al carbon; Lori liked her sour cream enchiladas with guacamole. The direct route from Dallas to Austin goes straight southwest Interstate 35, but my mother's map suggested that we could get some scenic driving along less-traveled roads by taking Interstate 45 southeast to Corsicana, and then wending our way to Austin on back roads from there. Billboards in Corsicana reminded me of an old favorite: Collin Street Bakery. 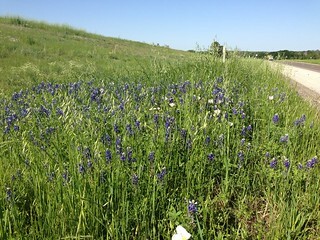 From the parking lot, I was able to take a picture of the bluebonnets on the side of the interstate. Collin Street Bakery sells the best fruitcake I have ever had. This is not necessarily saying much; it would be equally accurate to say that this is the only fruitcake I have enjoyed. Most of my other fruitcake experience has come from supermarket fruitcakes that taste like stultifying tedium and sugar-mummified citron. The Collin Street Bakery fruitcake, in contrast, tastes like apricots and nuts and just enough cake to hold everything together. 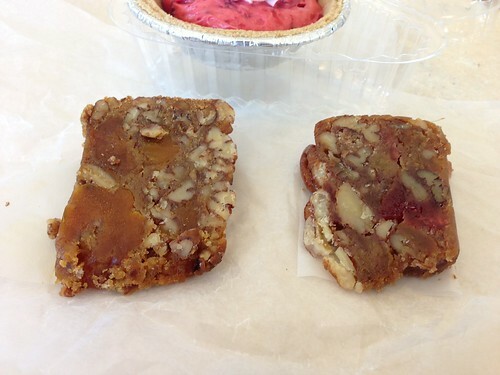 Or rather, the Apricot Pecan Cake lil on the left tastes like this. The cake on the right is the Texas Blonde Pecan Cake, which tasted of harder-to-distinguish fruits; we preferred the apricot cake. 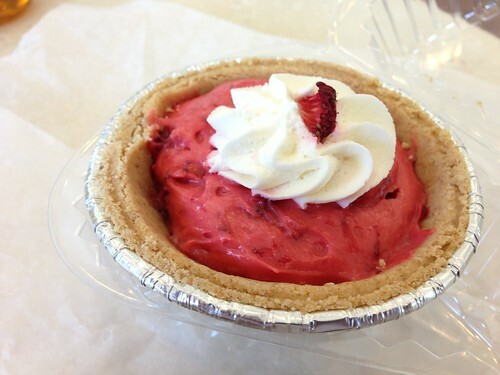 We also shared a strawberry tart, and this was a delight - it really tasted like fresh puréed strawberries and cream. The our detour was a pleasant one, but it somehow took much more time than I was expecting, and we got in to Austin almost two hours than I had planned. 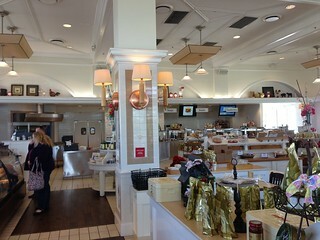 But we still managed to make contact with my cousin Adam, and he suggested a favorite restaurant of his: Kerbey Lane Cafe. Adam recommended the Kerbey Lane Queso. The distinction of the Kerbey Lane queso is that it conceals a secret: beneath the queso hides a generous portion of guacamole. The combination of the two dips with good chips was very nice. 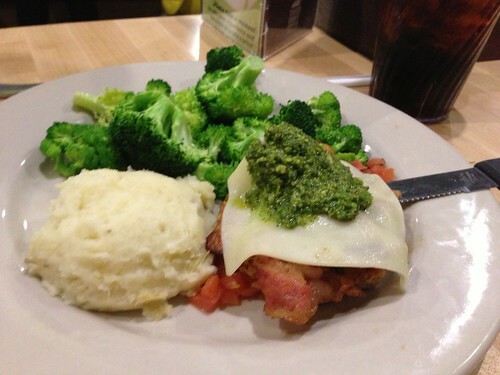 Lori's chicken topped with bacon and pesto was really good, probably the best entree of the evening. 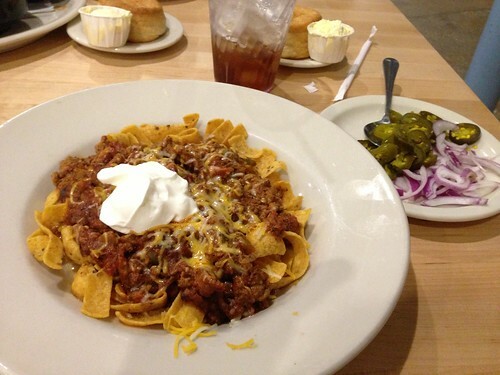 I didn't love my frito pie with bison chili as much, but it may be that it just wasn't the right time for it. The chili was served steaming hot (temperature, not spice), and it was such a large portion that the flavor became monotonous. But I can't figure out what would have made it better, and I wouldn't have wanted it to get so fancy that it lost touch with the nature of frito pie. 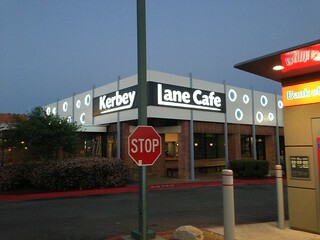 This location of Kerbey Lane offered one more advantage: it was half a block away from the Broken Spoke. 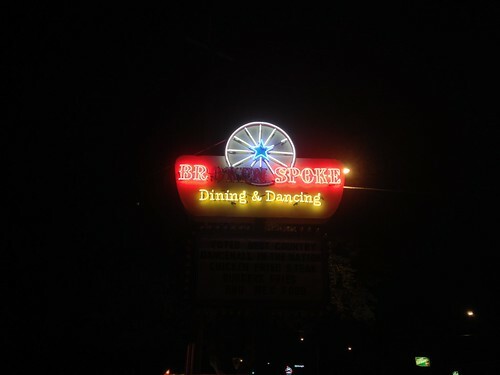 I had asked Adam to recommend a honky-tonk for our visit, and he immediately nominated the Broken Spoke, saying "it has the best of Austin and the worst of Austin all in one place." 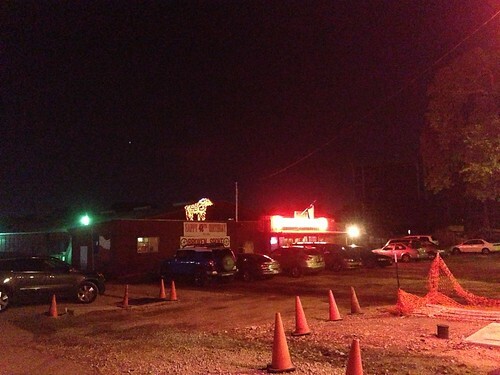 It was incongruous to walk half a block from an ordinary suburban shopping center to a joint with a dirt parking lot and an illuminated cow on the roof. 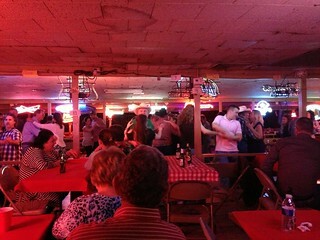 The Broken Spoke offers dancing lessons from 8 to 9, but we arrived at 8:55. Adam said that the lessons were only so-so, but I wish we had been able to attend, because I didn't feel able to pick up the two-step on my own; even when Adam explained the basics, I couldn't hear the two-step rhythm in the music. I'd have loved to feel able to join in the dancing, but I didn't feel adequate. So instead we watched others dancing, and it was fascinating. There were a lot of really good dancers on the floor, and they didn't seem like they were showing off, just dancing admirably for the pleasure of dancing. And there was a great diversity of dancers, from grey-haired men dancing with the low-key competence of decades of practice, to young women with tattoos and cowboy boots.